We can’t say for sure exactly where this came from but seeing as how it’s Friday, it’s time for something fun. 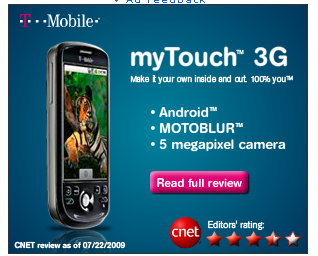 This picture above certainly represents someone’s cruel humor for MyTouch fans or Motorola fans, depending on how you feel about MotoBlur or knowledge fail. Either way, it’s Friday so enjoy the weekend! Mine has Sweeterhome 2, with lcars. Lol, why dont they just let us handle these things. And these ppl do reviews…hmmm. just lost some credit from me cnet. cnet should know better..disappointing cnet.. LMFAO!!! Yeah, like anyone would WANT to run MotoBlur on their MT3G… epic fail! Who cares about motorola? My touch 3G rules, epsecially v1.2 with double the RAM and swype. I SENT THIS IN!!!!! THANKS TMO NEWS FOR POSTING IT!